With the help of our many friends in the employment and disability communities, APSE has put together a thorough compilation of resources to help you learn more about Employment First and reach the goals you may have as an individual, student, business or provider. 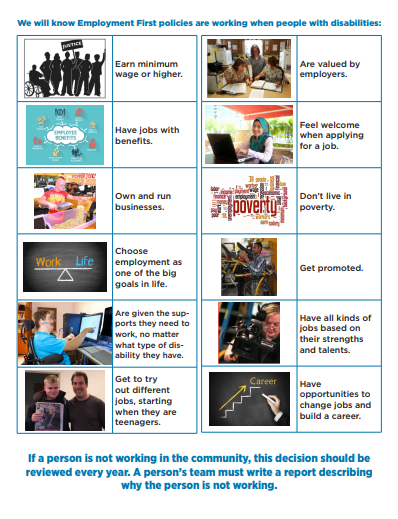 We’ve also illustrated through success stories the difference meaningful employment can make. LinkedIn – is the largest professional networking site available today. It connects and helps user stay in contact. APSE teamed up with LinkedIn to develop tips on networking, creating a profile, and more. LinkedIn provides more inclusive platform for people to use. Give it a try and get LinkedIn! 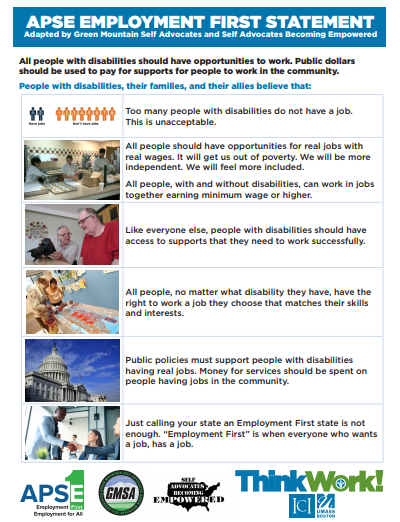 People with intellectual or developmental disabilities want to work in real jobs for real pay for many reasons. People with disabilities want equal rights to employment opportunities. Barriers continue to exist to closing sheltered workshops. Decisions about employment, careers, or college require thoughtful consideration. APSE pulled together some resources to help you evaluate and consider different options. Bridges to Work helps more than a thousand young people, each year, most of whom are transitioning out of high school special education to prepare for the workplace, and find a job with an employer in need of qualified, entry-level applicants. Creating and supporting mutually beneficial competitive employment relationships, the program creates opportunities for employment for youth while driving bottom-line results for business. This guide explains your legal rights as a student with disabilities ― both physical and learning disabilities ― and the campus resources that can provide you with assisstive services and tools. Additionally, they list a number of sites, apps, and software resources designed to aid students with specific types of disabilities, be they physical impairments or learning disabilities. Project SEARCH is a one-year, school-to-work program that takes place entirely at the workplace. This innovative, business-led model features total workplace immersion, which facilitates a seamless combination of classroom instruction, career exploration, and work site-based training and support. The goal for each program participant is competitive employment. APSE put together tips, facts, and resources on how to recruit, hire, retain and advance individuals with disabilities – and it’s all in one convenient place! Learn how to recruit, hire, retain and advance individuals with disabilities! A Better Bottom Line: APSE believes that a strong economy is fueled by all Americans working and contributing to the bottom line. 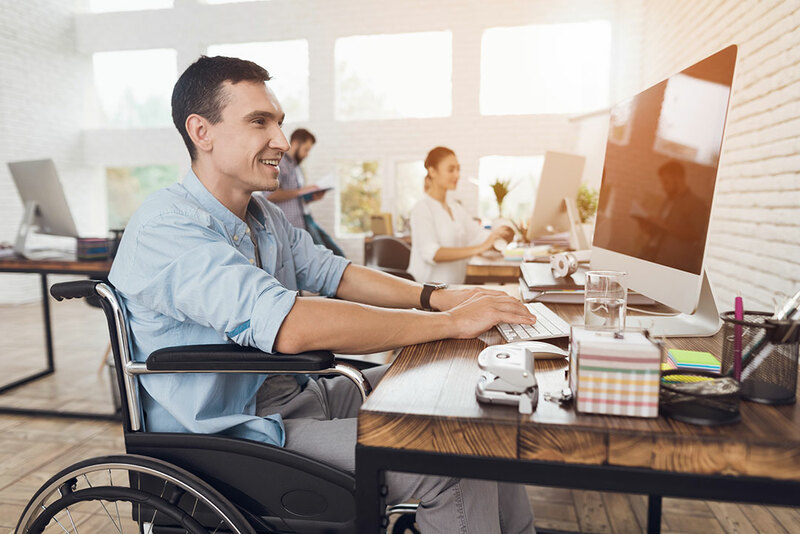 As an employer, people with disabilities represent an untapped talent pool to help you expand and enhance your business. Disability in the Workforce: At 79%, people with disabilities have the highest rate of unemployment or underemployment. Return on Investment: Employers see $28.69 average return for every dollar invested in accommodations. Small Business Tax Credit – 50% credit for expenditures between $250 and $10,250. Architectural/Transportation Tax Deduction – up to $15,000 per year. Work Opportunity Tax Credit – federal tax credit reducing employers’ federal income tax liability by as much as $2,400 per qualified new worker. Section 503: What does it mean for you? On September 24, 2013, the U.S. Department of Labor’s Office of Federal Contract Compliance Programs (OFCCP) published a Final Rule in the Federal Register that makes changes to the regulations implementing Section 503 of the Rehabilitation Act of 1973. With these new rules, private businesses that do business with the federal government (which is well over 20% of businesses) will be undertaking increased efforts to actively recruit and employ individuals with disabilities. As a federal contractor/sub-contractor, you may be asking how to improve your success with employing and retaining individuals with disabilities. As an organization exclusively focused on employment of individuals with disabilities, we can serve as an important resource to assist employers to meet these new requirements through identification of qualified job candidates, and assistance and supports to ensure these individuals succeed on the job. 7% Employment Goal: Federal contractors and subcontractors will now have a goal that 7% of individuals in each job group in their workforce consist of qualified individuals with disabilities. Data Collection: Contractors will be required to track data on the number of individuals with disabilities who apply for jobs and are hired. Compliance Enforcement: Contractors must allow the federal government to review documents to ensure they are complying with these new regulations. Affirmative Action Requirements: The regulations specify a series of requirements for federal contractors to ensure they are maximizing their efforts to recruit, hire, and provide career advancement to individuals with disabilities, including outreach to an array of disability organizations. Invitation to Self-Identify: In order to track recruitment efforts, under the new rules, federal contractors can now ask job applicants to voluntarily self-identify as an individual with a disability prior to receiving a job offer and after they have received a job offer. Additionally, current employees will be asked to voluntarily identify themselves as individuals with disabilities every 5 years. It will be critical to monitor the implementation of these voluntary self-disclosures requirements to ensure that the rights of individuals with disabilities to non-disclosure under the American’s with Disabilities continue to be respected. The new Section 503 regulations became effective on March 24, 2014. However, contractors with a written affirmative action program already in place on the effective date have additional time to come into compliance with the AAP requirements. Guidance Documents for Implementation of the Americans with Disabilities Act: These non-regulatory guidance documents provide technical assistance and serve as resources for state and local governments to comply with the Americans with Disabilities Act. Links to state and local community-based organizations serving job seekers with disabilities. EARN is part of the National Employer Technical Assistance, Policy, and Research Center at Cornell University funded by the Office of Disability Employment Policy, U.S. Department of Labor. 1 Siperstein, Romano, Mohler, Parker; “A national survey of consumer attitudes towards companies that hire people with disabilities”; University of Massachusetts, Boston, MA; Journal of Vocational Rehabilitation; 2005. 2 2003 Crain’s Chicago Business Survey; Washington Mutual, Inc. Study. APSE’s Legislative Advocacy Center gives you the current situation on policy matters that impact your work and provides action steps that you can take. The center also links you to resources for Take Your Legislator to Work Day. APSE statement on the Department of Education’s Notice of Proposed Rule Making for the Workforce Innovation and Opportunity Act regulations, posted May 17, 2018. Joint statement from APSE and Collaboration to Promote Self Determination (CPSD) on opposition to Medicaid work requirements, posted February 8, 2018. APSE statement of opposition to H.R. 620, the “ADA Education and Reform Act of 2017,” posted February 8, 2018. APSE statement on proposed ADA Education and Reform Act of 2017, posted September 8, 2017. Letter to the Secretary of Education regarding proposed changes in the regulations that define “Competitive Integrated Employment” in Title IV of the Workforce Innovation and Opportunity Act, posted September 5, 2017. APSE’s Employment First statement – adopted by APSE’s Executive Board in 2010, this statement remains a guiding force for APSE and its members. American Institutes for Research: The Purchasing Power of Working-Age Adults With Disabilities – shows that “People with disabilities are financial decision makers who select investments, including accounts and retirement accounts and that businesses would do well to recognize these disability types and unique consumer needs. National Council on Disability’s Home and Community-Based Services: Creating Systems for Success at Home, at Work and in the Community – in this report, NCD reviews the research on outcomes since Olmstead, and finds that strong trends indicate that smaller, more dispersed and individualized community settings further integration and positive outcomes for individuals with disabilities. Specifically, greater individual choice, satisfaction, housing stability, and higher levels of adaptive behavior and community participation are associated with living in residential settings of smaller size. President’s Committee for People with Intellectual and Developmental Disabilities: Report to the President 2017, America’s Direct Support Workforce Crisis: Effects on People with Intellectual Disabilities, Families, Communities and the U.S. Economy – provides an overview of the effects of the direct support workforce crisis and the opportunities to address it in ways that strengthen the ability of people with intellectual disability to both participate in and contribute to their communities and the American economy. At the end of 2017, the Department of Justice (DOJ) rescinded guidance on the application of the Integration Mandate of Title II of the Americans with Disabilities Act (ADA) and Olmstead v. L.C. to state and local government's employment service systems for individuals with disabilities. APSE has archived the guidance documents here. There is no better explanation of Employment First than a success story! APSE is proud to share the success stories of the Employment First movement. For every industry, every disability, and every community there is a success story to share. We’ve selected just a few of our favorites. If you have a story you’d like to share, please contact us at info@apse.org. Performing Arts Studio West (PASW), a non-profit affiliated arts program funded by the State of California Department of Developmental Services through the Regional Centers of the Greater Los Angeles Area, provides hands-on individualized training, career management, and on-location support for performers with intellectual disabilities working in film, television and commercials. PASW performers have been working professionally in film, television, commercials, music videos, and integrated theater productions for more than nineteen years. The performers have earned more than 1,800 roles, including three roles on the multi Emmy award winning A&E docuseries "Born This Way." For more information, please visit www.pastudiowest.com and https://www.youtube.com/user/PASWTV. Community Involvement Programs (CIP) of Minneapolis, MN, develops customized jobs in the community that capitalize on each individual's interests, abilities, and personal goals - and with great success. From Fedex to flowers, CIP placements deliver results. Learn more at https://everyoneemployed.com. Looking for a reminder about why we do what do? Take a few moments and watch the #InclusionWorks videos from Clark County, WA. The stories of employment specialists and employees beautifully illustrate the benefits that supported employment brings to individuals, families, businesses, and communities.